The mentally deficient man with guts is a thousand times better than the indecisive intellectual. “[It] would mean surrendering the future of Iraq to al Qaeda. It would mean that we’d be risking mass killings on a horrific scale. It would mean we’d allow the terrorists to establish a safe haven in Iraq to replace the one they lost in Afghanistan. It would mean increasing the probability that American troops would have to return at some later date to confront an enemy that is even more dangerous.” - Former President George W. Bush in 2007. [Source]. "The interesting part about the Iraq debate, by the way, is I don't hear a lot of discussions about what happens if we fail. There needs to be a serious discussion about what happens if we create a vacuum into which radical movements flow." - Former President George W. Bush. 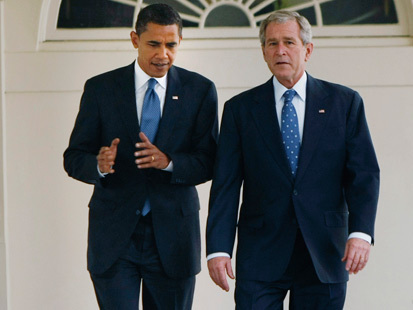 President Bush was wrong to enter Iraq, and President Obama was wrong to exit Iraq. It was a stupid war, as President Obama articulated when he was running for president in 2007, but it was more stupid to leave Iraq to Maliki and his goons in 2011. So the winner in this epic duel of presidential decisions regarding Iraq is George W. Bush, because he did the less stupid thing by comparison. George W. Bush Predicts ISIS In 2007. Source: FunkensteinJr. Date Published: September 5, 2014.